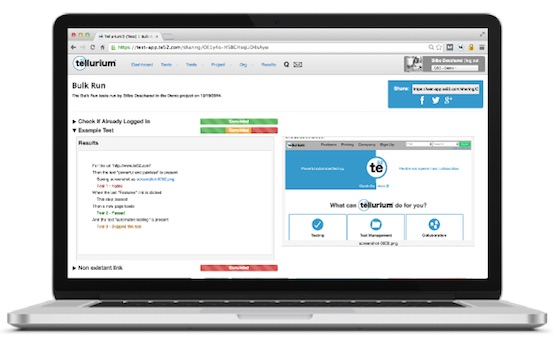 Tellurium is designed for QA testers, and businesses of any size to automate testing easily and efficiently. A complete cloud-based solution for collaborative testing and test management. No matter the testing methodology, Tellurium allows to create, modify, execute, and generate reports from anywhere on any device with a web browser. With unlimited run minutes, one can schedule tests (or even multiple tests) to run as often as required. As Tellurium offers Plain English automated scripting language, tests are easy to read yet as powerful as traditionally-coded tests. No installation required. Comments: The tool was easy to use, it was complemented with good documentation. The UI was simple and would enable every one do develop automation scripts.